Resect and discard is a new paradigm for management of diminutive polyps, in which small polpys are resected and discarded instead of being sent for histopathology examination. There is a very small risk of having advanced pathology or cancer in a small polyp. Reported advantages of the resect and discard paradigm are that costs are reduced, and surveillance recommendations can be provided the same day as colonoscopy. However, It is unknown whether patients will embrace this new paradigm in which small polyps would not be sent for histopathologiy review. The focus of this study was to determine whether patients would be willing to pay for pathology costs with their own money if necessary (hypothetical situation in which insurance would not pay) and which factors influence patients’ decisions to pay or not pay for pathology costs with their own money. Although the resect and discard paradigm has advantages in terms of cost-savings, it may not be accepted by patients, since small polyps have a very small risk of containing advanced histology or cancer. Therefore it is important to understand if patients would be comfortable with a situation in which their colon polyp was not sent for histopathology examination. If they are not, then endoscopists should consider this when deciding whether or not to practice resect and discard. Figure 2. Importance of factors associated with willingness to pay out of pocket for histopathologic analysis of polyps. In this study, 72% of patients would be willing to pay for histopathology costs if necessary, in order to have their polyp examined by a pathologist. 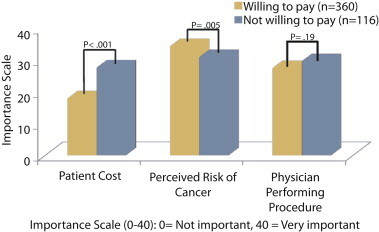 Factors associated with willingness to pay included cost and perceived risk of cancer. Patient factors associated with willingness to pay included female gender, higher education and higher income. This suggests that the majority of patients are NOT comfortable with a resect and discard strategy, and this should be considered by endoscopists before instituting a resect and discard program.